John Whitcraft, P.E. summarizes critical information on California Title 24 and CalGreen Code Updates scheduled to take effect on July 1, 2018. John attended a recent workshop led by Deputy Director, Michael Nearman of the California Building Standards Commission, and wrote a comprehensive blog for the AIA of San Diego to share with the construction community. John Whitcraft, PE, knows that the right software tools can help keep his work on time and within budget. One of his must-use tools is Bluebeam Revu workflow and construction management software. Among its many capabilities, Bluebeam enables John to electronically stamp and sign off on a construction document so that his signature is verifiable immediately. It works within AutoCAD as a high quality PDF creator. Bluebeam has the ability to count reference points with a certain shape or label, as well as create tables or schedules of lighting fixtures, skylights, and other construction materials. The multi-level program saves clients time and money while ensuring the highest quality of service from Whitcraft Engineering Solutions, Inc. Visit Bluebeam’s website for additional information. John names Bluebeam as one of his “Can’t Do Without It…” tools when interviewed by Construction Dive Magazine . For more information about how your project can be delivered on time and within budget, contact John at (858) 229-8722. The Veterans Tribute Tower at San Diego’s Miramar National Cemetery was a project John elevated with superior light and sound design. The blog post featured on the American Institute of Architects of San Diego site provides more insight into John’s creative approach to achieving best results. Designing the electrical plans for the Wounded Warriors-Freedom Station was a chance to improve the safety and living conditions for our injured veterans. This was a volunteer project that not only enlightened John on the merits of this non-profit organization, but also allowed him to explore the underside and inner walls of a cluster of old buildings. John submitted his plans to Sandy Lehmukuhler, President of the Wounded Warrior-Freedom Station in early March 2017. “We are so appreciative of what Mr. Whitcraft has done for us. Thank you so very much,” says Sandy. This patriotic charity offers injured soldiers, sailors and Marines a recovery transition center and housing facility where they can safely heal from war-related physical and mental injuries. This housing was selected partly for its location just minutes away from the Naval Medical Center, San Diego. The proximity to the hospital allows easier access for the Warriors to receive the medical treatment that is so important to their physical and emotional recovery. 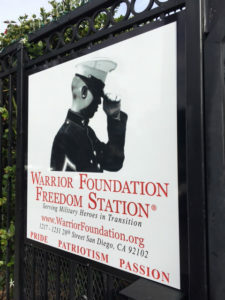 For more information on this charity, please visit their website to view the photos of the Freedom Station. Read John’s one-on-one interview with Construction Dive reporter Chris Wood. He mixes paper with tech when offering his perspective on best practices for keeping a construction site on task and on time. Subcontractors sound off: 5 ways to improve job site tech adoption. John Whitcraft shares his insight on technology with Construction Dive Magazine. The paperless revolution is in full swing in AEC, but to provide job-site subs with the level of detail they’re used to from construction drawings, the screen size and usability of smart phones hasn’t proven ideal. John Whitcraft is the president and founder of San Diego-based Whitcraft Engineering Solutions, which provides Title 24 compliance and electrical engineering to projects across California. He questions whether job sites will ever be entirely paper-free. If they are, he said, it will be because of tablet technology. Profiled by BestColleges.com in their “Meet The Expert” series, John Whitcraft shares his insight on electrical engineering with students considering this field. If you enjoy math and science, and have a passion for design, you may be interested in electrical engineering. One of the newest branches of engineering, electrical engineering is a broad field that covers the application of electricity and electronics. As digital technology became more prevalent throughout the twentieth century, the number of subfields in the discipline grew alongside. Today, electrical engineers study electronics, digital computers, power electronics, biomedical instrumentation, communications, circuitry, microelectronics, and much more.